Our NEW POP UP greenhouse only includes one whole collapsible cover up and 2 folding fiberglass poles, so easy to set up. The Eco-friendly New Material---600D oxford combined with 18mil clear PVC cover, 1.5mmx6mm steel-wire rods and 8.5mm fiberglass poles, passed the SGS Test. Certified environmentally friendly materials, greatest help of healthy growth for your plants. You deserve to own it. 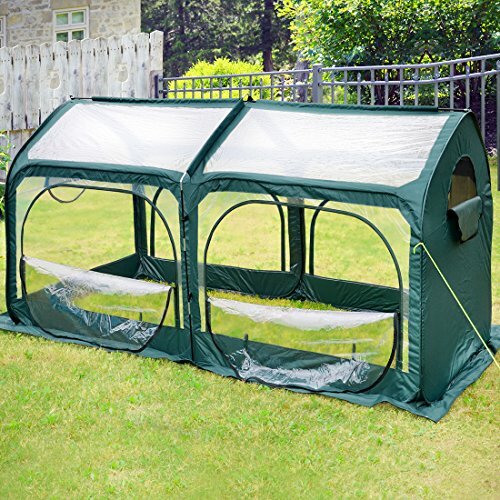 EASY TO SET UP -- Stretch the collapsible pop up cover and run the 2 folding fiberglass poles through the top and a pop up greenhouse presents to you. Much convenience to fold it up and store when not using in summer. ECO-FRIENDLY MATERIALS - Access to the SGS test report recognition. Fine processing of 600D oxford combined with 18mil clear PVC cover, Waterproof UV protection. 1.5mmx6mm steel-wire rods and 8.5mm fiberglass poles, with high-end quality and unique design, good performance and longer life to use. 6 STAKES PROVIDED -- Help to strengthen the tent. Special design of cloth buckles around the tent, so that you can use extra ropes and stakes easily in bad weather. 4 LARGE ZIPPER DOORS-- Rolling from upper part. Unique buckle design, effective protection of the rolled zipper door, you can walk in easily. Two zipper screen windows, adjust the sunlight and temperature inside. OVERLONG COVER DESIGN -- Effective protection of plant growth. Makes Greenhouse More Airtight and Secure, Just Bury It in The Soil. Designed for Garden Box Kit/ Flower Beds. If you have any questions about this product by Quictent, contact us by completing and submitting the form below. If you are looking for a specif part number, please include it with your message.